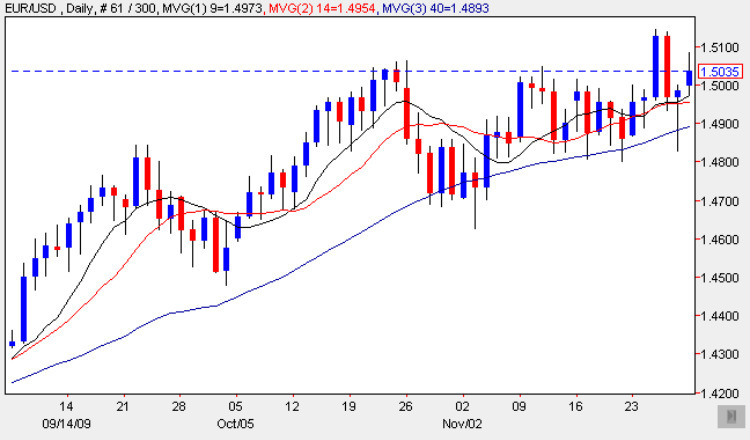 Yesterday’s attempt to move higher by the euro dollar was capped in later trading, with the currency pair ending the trading session marginally higher, but with a deep shadow to the upper body of the candle, suggesting that the bearish sentiment evident in the last few days seems to have remained in place, with the bulls failing to take control following the sharp sell off on Thursday last week. Yesterday’s candle, combined with that of Friday, are beginning to suggest that the euro dollar is now beginning to struggle at this level once again, and only a break and hold above the 1.5150 price handle will now suggest otherwise. The positive signal at present for euro dollar bulls is the continued support being provided by the moving averages, in particular the 9 day average at present, and whilst this technical support remains in place then we can assume thatthe euro dollar is likely to rise in the short term. However longer term, and for the breakout to be confirmed we need to see a break and hold above the level outlined above, and should this occur in due course then we canassume that the bullish momentum has returned with the prospect of a move towards the 1.52 and 1.55 price points in due course. A variety of fundamental items of news this morning for the Eurozone including German Retail Sales which came in at 0.5% and the German unemployment change which came in far better than expected at -7k. This morning also saw Eurozone final PMI which came in at 51.2 and Eurozone unemployment which registered at 9.8%. Meanwhile in the US the markets will be watching the ISM figure which is forecast at 54.8 – this economic release is closely watched by traders as it is considered a leading indicator of economic health and will confirm if manufacturing in the US is continuing to grow. At the same time as the ISM the Pending Home Sales will also be released and these are expected to come in at -0.4% & along with the ISM is considered a tier one release so expect some market reaction.